The Electrified Powertrains Library assists the entire process of designing electrified powertrains. It covers the key components of an electric drive system with varying levels of complexity, i.e. physical, switched, averaged or energy-based. Model variety covers electric machines with associated controllers, e.g. field-oriented control and inverters with corresponding modulation methods, e.g. space-vector modulation. Further components, e.g. 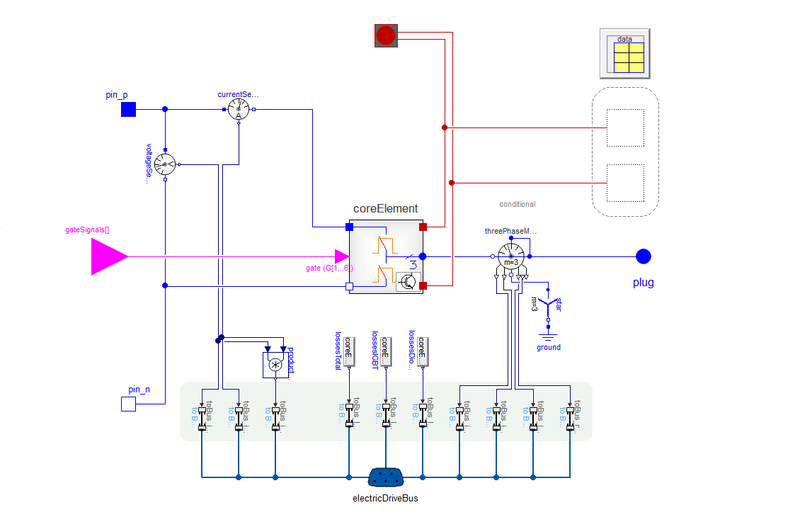 longitudinal dynamics, control unit, driver and energy supply are provided to simulate the entire electric powertrain of battery- or hybrid electric vehicle (BEV/HEV) topologies. 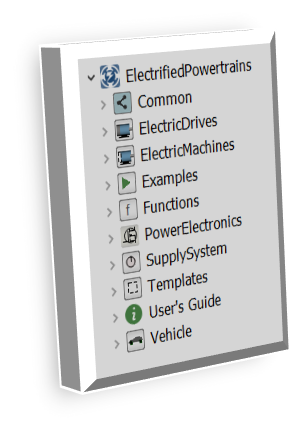 The Power Electronics package contains components of electronic devices required in the context of electric drive modeling, e.g. inverters, converters and rectifiers. 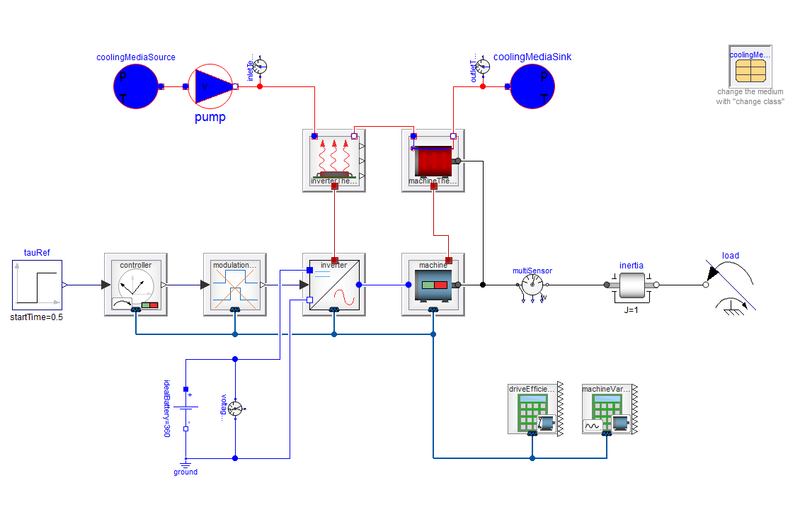 The Electric Machines package provides control for physical models of asynchronous induction- and permanent-magnet synchronous machines. 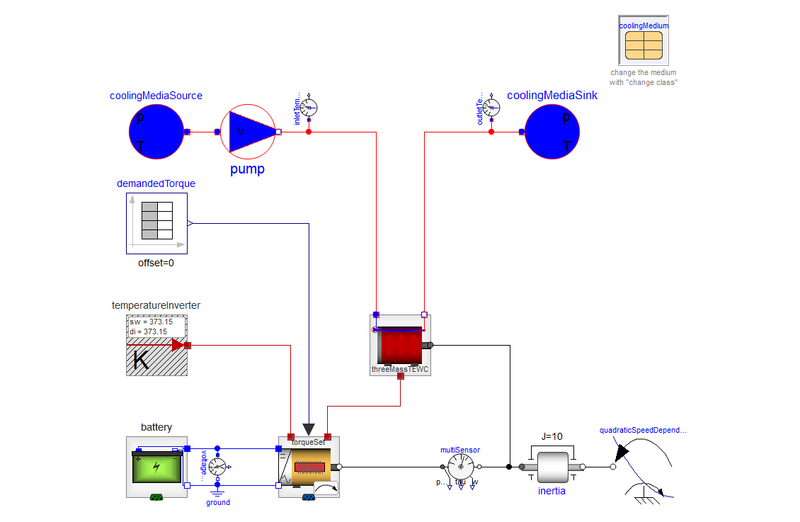 The machine models extend the MSL electric machine models and add necessary in- and outputs for controlling the machine. The Electric Drives package provides models of electric drives in different levels of detail. For instance the user can configure a table-based electric drive for e.g. efficiency analysis or a more detailed model based on averaged or switched inverter models and physical models of the electric machine to e.g. investigate for current ripples. The Supply System package extends the library with basic energy storage models, i.e. batteries and range extenders. The Vehicle package allows setting up example use cases for electric drives in different characteristics, providing an expandable and configurable infrastructure as well as all required components from environment to operational control models.